How do I Build Fake Wood Beams? Exposed wood beams add a rustic look to a room, but also are heavy and difficult to install. 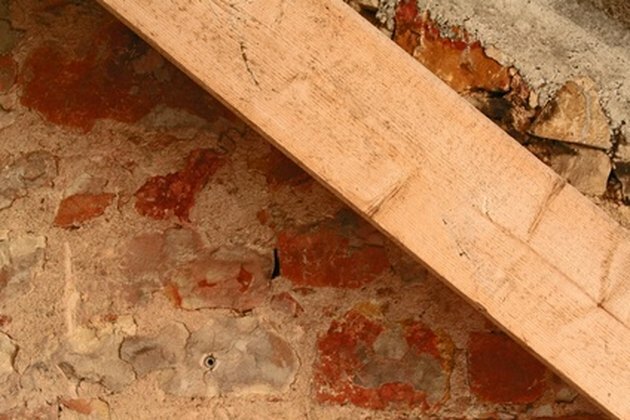 Fake wood beams give the appearance of real wood, yet you can make and add them yourself. Build them of planed wood, add decorative moldings and paint them for a more sophisticated appearance. Or make them of roughly sewn wood and stain them for an informal country look. Imitate a real wood beam with narrower boards. Measure the length of the ceiling with a tape measure at the location at which you will install the first beam. Saw a 1-by-6-inch board one-quarter inch shorter than the length of the ceiling, so you'll have space to slip it in place. Mark the cut using a carpenter's square and use a circular saw or hand saw to cut it. This board will fasten to the ceiling and hold the fake beam in place. Locate the studs in the ceiling with a stud finder. Measure their spacing at which you'll be installing the beam, and mark the same measurements down the middle of the board. Drill a pilot hole for a two-inch screw at each of the marks. Install the board flat against the ceiling by screwing a two-inch screw through the pilot hole into each stud. Saw a 1-by-6-inch board and two 1-by-8-inch boards the same length as the first board. Spread carpenter's glue on the edges of the six-inch-wide board and lay it flat on the floor or a work table. Nail the eight-inch-wide boards to the edges with 2 1/2-inch finishing nails spaced every foot--so that the three boards form a trough for the three sides of the hollow fake beam. Check the sides with a square to make sure they are at right angles. Let the glue dry. Finish the fake beam in your preferred style before installing it. Lift the fake beam up against the ceiling so the board you attached earlier fits between the sides. Nail the beam in place by hammering 2 1/2-inch finishing nails through the vertical boards and into the edges of the board that's attached to the ceiling. Touch up the finish over the nail heads if you want. Build and install the other beams the same way.